This eight-part webquest bundle will allow students to learn about all of the big U.S. Government and Civics topics! ***Each webquest starts on a separate page, allowing you to pick and choose when you will begin each. ***Each webquest has a key included for your convenience! 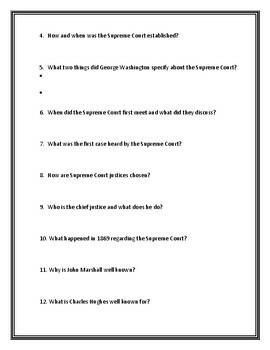 This 18 question History.com webquest will help students learn all about the Supreme Court! How the Supreme Court was created. The functions of the Supreme Court. Changes the Supreme Court has gone through since its creation. How this court functions with the other two branches in our government. Students will learn all about the Legislative Branch of government in this 23 question History.com webquest! The significance of the Legislative Branch. Background on the House of Represenatives and the primary jobs in the House. Information about members of the House of Representatives. Background on the Senate and the primary jobs within the Senate. Details about how the Legislative Branch functions with the president. General information about checks and balances. 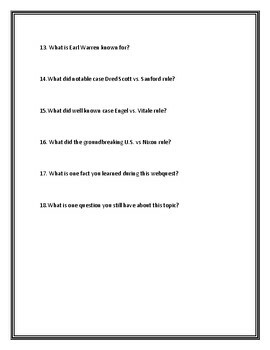 Students will learn about the of the Executive Branch of government through this 18 question History.com webquest! How the Executive Branch and the presidency was developed by the framers of the Constitution. The powers and duties of the president. The powers and duties of the vice president. Details about how checks and balances occur within the Executive Branch. Information about the use of executive orders and how they have been utilized throughout history. 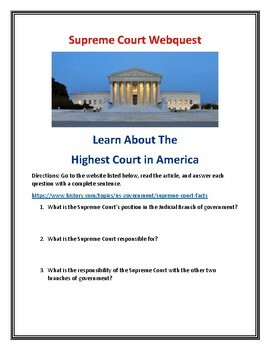 This 20 question History.com webquest will help students learn about the Judicial Branch of government! How and when the Judicial Branch was established. The evolution of the Judicial Branch over time. The primary job and function of this branch of government. How the Judicial Branch interacts with the other two branches of government. Information regarding several groundbreaking Supreme Court cases. 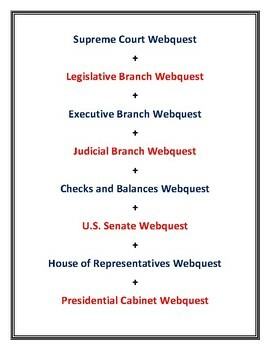 This 16 question History.com webquest will help students learn all about checks and balances in the U.S. government! How checks and balances first began in the United States. Information regarding how this system was based on ancient civilizations that also required checks and balances. The reasoning behind checks and balances. Examples of how checks and balances are used within government. Information on times in our history that checks and balances have been tested. This 24 question History.com webquest will help students learn about the United States Senate! How the Senate was first formed during the Articles of Confederation. The changes to the Senate over the years. The difference between a bicameral legislature and a unicameral legislature. The primary tasks of the Senators. The role of the Majority Whip and the role of the Vice President in Senate. Other general information about the Senate. This 24 question History.com webquest will help students learn about the House of Representatives! How the House of Representatives was first formed during the Articles of Confederation. The changes to the House of Representatives over the years. The primary tasks of the representatives. The role of the Majority/Minority Whips and the role of the Speaker of the House. The role of the House members in passing a law. Other general information about the House of Representatives. This 22 question History.com webquest will help students learn all about the history of the presidential Cabinet! How the Cabinet was first formed. George Washington's use of the Cabinet. Details about events in history that impacted the Cabinet. Information regarding how and when new positions were added to the Cabinet. The role the Cabinet is meant to play in a presidency. Downsides and difficulties of the Cabinet.